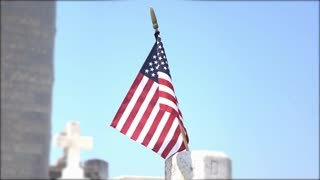 Search Results for "us military flag cemetery"
Arlington Cemetery President Kennedy grave tilt to flag 4K. Arlington National Cemetery a United States military cemetery in Arlington County, Virginia, across the PArlington Cemetery President Kennedy grave tilt to flag. United States USA flag Fredericksburg Battlefield 4K. Fredericksburg and Spotsylvania National Military Park and surrounding Civil War Confederate cemeteries. 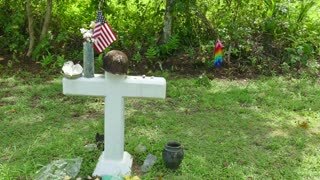 Soldiers were buried and memorial build to honor Union and Confederate soldiers. Iwo Jima Memorial Marine Corp close flag Washington DC 4K. United States Marine Corps War Memorial, Iwo Jima Memorial is a United States military monument at the entrance to Arlington National Cemetery. Dedicated to all United States Marine Corps. 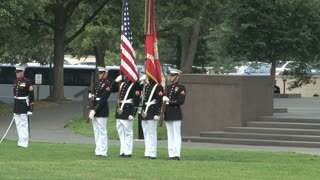 Washington DC United States Marine Corps War Memorial flag flying 4K. United States Marine Corps War Memorial, Iwo Jima Memorial is a United States military monument at the entrance to Arlington National Cemetery. Arlington Cemetery President Kennedy grave eternal flame 4K. Arlington National Cemetery a United States military cemetery in Arlington County, Virginia, across the Potomac River from Washington, D.C. Over 400,000 interments. Washington DC from Arlington National Cemetery HD. Arlington National Cemetery a United States military cemetery in Arlington County, Virginia, across the Potomac River from Washington, D.C. Over 624 acres With more than 400,000 interments. Washington DC city from Arlington National Cemetery airplane landing 4K. Arlington National Cemetery a United States military cemetery in Arlington County, Virginia, across the Potomac River from Washington, D.C. Over 624 acres. Arlington Cemetery Eternal Flame President Kennedy grave 4K. Arlington National Cemetery a United States military cemetery in Arlington County, Virginia, across the Potomac River from Washington, D.C. Over 624 acres. 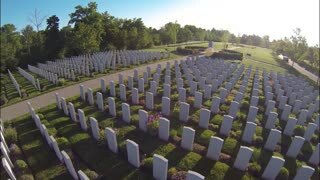 Arlington National Cemetery Canadian Cross headstones 4K. Arlington National Cemetery a United States military cemetery in Arlington County, Virginia, across the Potomac River from Washington, D.C. Over 624 acres With more than 400,000 interments. Arlington National Cemetery Change Guard of Honor 4K. Arlington National Cemetery a United States military cemetery in Arlington County, Virginia, across the Potomac River from Washington, D.C. Over 624 acres With more than 400,000 interments. Arlington National Cemetery Change Guard of Honor 2 4K. Arlington National Cemetery a United States military cemetery in Arlington County, Virginia, across the Potomac River from Washington, D.C. Over 624 acres With more than 400,000 interments. Arlington Cemetery President Kennedy grave tourist respect 4K. Arlington National Cemetery a United States military cemetery in Arlington County, Virginia, across the Potomac River from Washington, D.C. Over 624 acres. Arlington National Cemetery Guard Tomb Unknown Soldier part 1 4K. Arlington National Cemetery a United States military cemetery in Arlington County, Virginia, across the Potomac River from Washington, D.C. Over 624 acres. Spotsylvania Confederate Cemetery flags 4K. Fredericksburg and Spotsylvania National Military Park and surrounding Civil War Confederate cemeteries. 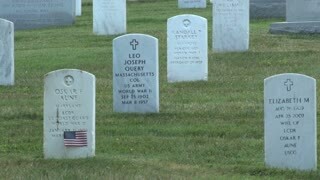 Soldiers were buried and memorial build to honor Union and Confederate soldiers. Gettysburg, Pennsylvania, United States - in 1980: The historical Gettysburg national military park cemetery of USA in 80s archival . Soldiers National Monument and evergreen field of war graves. Gettysburg, Pennsylvania, United States - in 1980: The historical Gettysburg national military park cemetery of USA in 80s archival . Statue of General George Meade and State of Pennsylvania Monument. School Children Marching In Road For Veterans Day Parade With Flags Dci 4K 434.School children and teachers march from rural city center to cemetery to honor veterans and military members. Patriotic patriotism and respect. School Children Veterans Day Parade With Flags Dci 4K 432. School children and teachers march from rural city center to cemetery to honor veterans and military members. 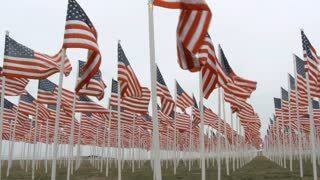 Patriotic patriotism and respect. 1918 - A soldier places a flag on a grave in the Military Cemetery in Abeele, Belgium, and General Read in Fruges, France, during WWI. Cemetery Memorial Day flowers happy birthday 4K. 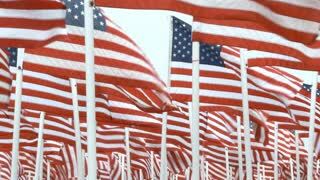 Memorial Day is a federal holiday in the United States for remembering the people who died while serving in the country's armed forces. Couple at Washington DC Marine Corp National Monument 4K. United States Marine Corps War Memorial, Iwo Jima Memorial is a United States military monument at the entrance to Arlington National Cemetery. Battle of Iwo Jima in World War II. Military veterans walk in a graveyard and soldiers march, at the United States Capitol, and ride horses, in 1941. 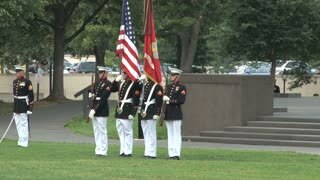 Washington DC United States Marine Corps War Memorial zoom 4K. United States Marine Corps War Memorial, Iwo Jima Memorial is a United States military monument at the entrance to Arlington National Cemetery. U.S. Marine honor guard leads a funeral for a fallen soldier. bright morning sun in the cemetery.